Chocolate Coffee Toffee Crunch Muffins are almost as fun to say as they are to eat. 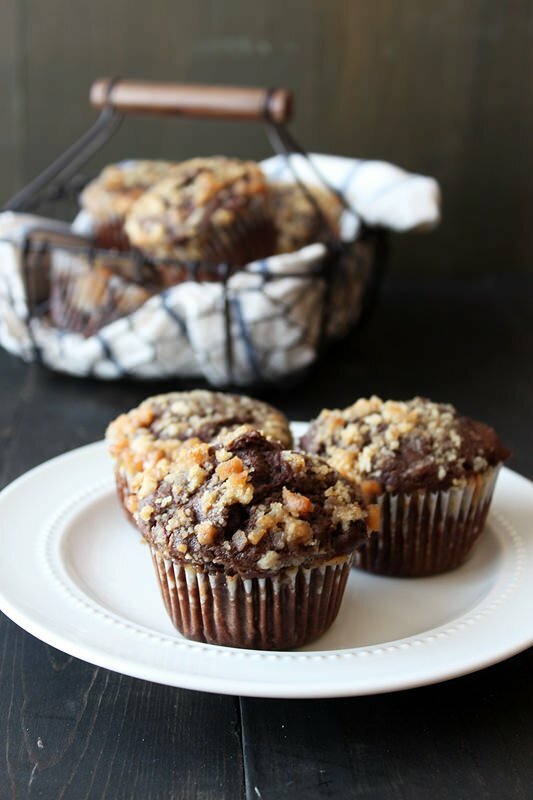 Mocha muffins are studded with chocolate chips and topped with a crunchy toffee streusel. Taste: These muffins have so much more flavor than almost all store-bought muffins I’ve ever tasted. Texture: The muffins are soft with bits of melty chocolate chips throughout but the best part is definitely the crunchy toffee topping. It adds a whole new layer of texture to muffins! Appearance: I love the contrast of the dark chocolate muffins with the light tan toffee topping. Pros: Fun way to say and eat muffins. Cons: None, though I may try to use a 50/50 ratio of whole wheat flour to white flour next time and see if it tastes good. Don’t you love the crazy name of these muffins? I was inspired by my food blogger BFF Ashley who posted a recipe for Toffee Coffee Chocolate Chip Blondies a few months ago. Both the name and the idea of the flavor combination sounded wonderful so I knew I had to take it as inspiration to make some other scrumptious sweet treat. So I came up with chocolate coffee toffee crunch muffins! Weeeee. Also, I can’t think about muffins without thinking about Jenna Maroney from 30 Rock (rest in peace) and her Muffin Top song. Try not getting that stuck in your head all day long. Preheat the oven to 375°F. Line a muffin tin with paper muffin cups. In a large bowl combine the flour, brown sugar, sifted cocoa powder, espresso powder, baking powder, baking soda, and salt. In a small bowl combine the melted butter, buttermilk, eggs, and vanilla. Pour the butter mixture into the flour mixture and stir until combined. Stir in the chocolate chips. Do not overmix. In a small bowl combine the flour, sugar, and toffee bits. Cut the butter into the mixture using the back of a fork until it is coarse and crumbly. Sprinkle about a tablespoon of the mixture over each unbaked muffin. Bake for 20 minutes, or until a cake tester inserted into the center comes out clean. Transfer the pan to a wire rack to cool for 5 minutes before removing the muffins to the rack to cool completely. Yes, I love the name of this post. You are right, it just sounds good!! Plus, they looks delicious and any chocolate muffin is normally a winner in my eyes! How amazing are these, Tessa? I love recipes that rhyme. It makes me smile. I’m so corny! But these look delicious and I wouldn’t mind jumping out of bed any morning for one! Chocolate, coffee, and toffee?? This muffin looks and sounds amazing! Will have to give this a try–thanks for sharing! I love the name and I love the muffins – homemade muffins are one of my favorite things!! Love the flavors in these muffins! Wish I were snacking on one right now! Wow! Are these real life?! They look absolutely incredible. Pinning! These sound so good…way to take the classic double chocolate muffin and make it new again! I haven’t had a chocolate muffin in ages, but they used to always be my favorite. Adding the coffee and toffee would make them even better, I’m sure! Yum – I am a huge muffin person, and that toffee topping sounds incredible! Love every word of this recipe title! Wish I had that basket in front of me for breakfast tomorrow. I am loving every single thing you have in these muffins! I could definitely go for a few of these with my coffee this morning! These muffins look amazing Tessa!! And they look like the perfect thing to use the buttermilk that is sitting in my fridge!! WOW. this look phenomenal! just pinned this recipe to try…thanks so much for sharing. I love toffee flavored things! Have you ever had the hersey nuggets? its like milk chocolate + almonds + toffee? so good! These muffins look mouth-watering good! I can’t wait to try them this weekend. I was so excited when I saw this recipe it sounded amazing. So for a party three of us all made this recipe three different homes. They all turned out the same and all three of us were disappointed. Flavor was nothing what the name would lead you to believe it tastes like. :0( hope the next recipe I try of yours is better. Hi Sally, I’m sorry you didn’t enjoy the recipe. I’m not sure what makes you say the flavor wasn’t like the name, there is plenty of each namesake ingredient in the recipe! Can freshly brewed coffee be substituted for espresso powder? Can’t wait to try this recipe! I love muffins but haven’t made any in a while!! I think I may have to get back in the muffin groove and whip up a batch of these! I mean, toffee streusel, you can’t go wrong!! I can’t wait to try them!! The pictures alone made me want to try this muffin recipe. I love chocolate and toffee. These were delicious muffins! I followed the recipe except for adding the espresso powder, since I don’t drink coffee. These are a definite keeper! Thanks for the recipe! Glad you made it work for you, Kristin! This looks amazing!! What is espresso powder? Brand name? I went to my local grocers and they don’t carry it. Sometimes it can be hard to find, but Walmart and Target both carry it near me! There’s King Arthur and Medaglia D’oro. Hope that helps! Is the espresso powder instant? I was really disappointed. These looked so good, but I made them tonight and they’re horrible. They have no flavor and a strange texture. I bake all the time, and followed the recipe exactly. What a waste of ingredients! I just made these exactly like the recipe except for adding about a cup of pecan chips. Came out fabulous! Made 12 muffins and small mini-loaf. Thanks! These sound wonderful. I love the flavor of coffeee, but I can’t have caffeine though. Do you think I could use an instant decaf coffee? Or is espresso powder even more fine than regular instant coffee? Thanks. These made way more than 12 muffins. Were you using a standard muffin tin? I doubled the recipe, and got 36 muffins out of these, so one batch for 24 would have been fine.